is in the middle of the board, six squares if it is on the edge, or four if it is in the corner. Some of these squares may be blocked by the king's own supporting pieces, but the rest must be taken by the attacker through the agency of his own pieces or pawns. If all the squares surrounding the king are taken from it - some through being being blicked,others by being 'in check' and if the square on which the king stands is also in check and without means of defence, then the king is check-mated. This is well known, and it seems rather banal to start out from this basic pattern or anatomy of mate; but in fact certain elementary rules can be formulated only on this basis. 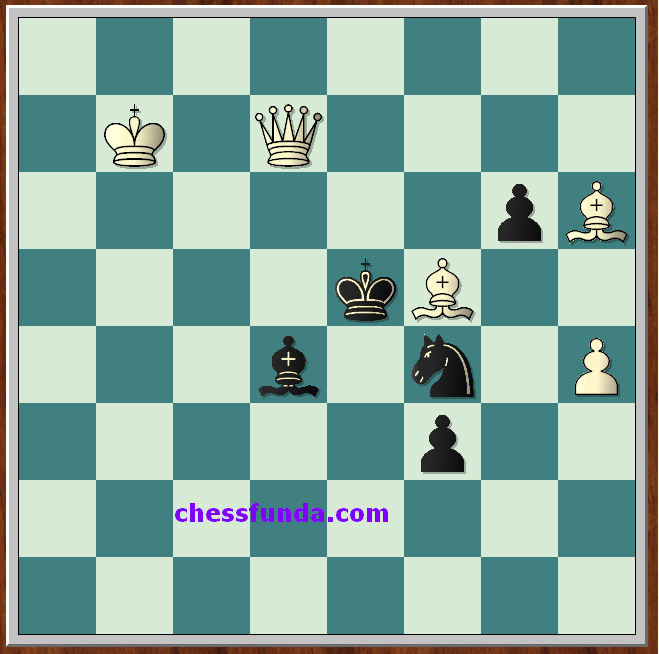 In the next position Black to meve, is unable to avoid mate in 4 different variations. The final or mating position is called the mating patten, and this term is especially useful when such a pattern is worth remembering. A mating pattern can be typical (i.e. one which frequently occurs) or atypical. We call a mate pure if none of the squares concered is covered by two or mor attacking units. Thus 1---Ne2 2 Qe6 is a pure mate, whereas 1---Kg6 2 Bg7 is not, thought it would be if we were to remove the bishop on f5. Pure mates are valued in chess problems, but in practical play they are unimportant. In the mating pattern which we have seen, some of the black king's flight squares have been blocked by its own pieces, while the rest have been covered by the opponent's forces. The sum of these combined factors is known as a mating net.